I received today a super secret source of a photo of a new product GW which is to go only to China. It looks like a box like Space Hulk, meaning a new game, a closed box ... if these models on the cover are models in a box, then ... jaram! Wait. Wondering if it's car wars for Orks...Quick! How big are the models!!! I'm almost certain this is the pocket model card game previewed a while back. It looks to me like the old styrene push fit card pieces similar to Star Wars, Pirates, and a few others from 2008ish.. only with a board game twist. EDIT: Wait.. that one is called Gretchin! .. hmm.. wonder what this could be then..
You have no idea how much my heart sank then exploded with joy in the process of reading this post. My inside guy has been telling me bout a orky racing game since March but i kept it quiet, shouldn't have lost some bragging rights there, lol. I'm going to wait for pictures of the contents before I let myself get too excited. Could be those oft-requested new buggies though! If that's what's in there the actual boxed game basically doesn't matter. If these turn up second hand I am definitely gong to build out a junk yard themed table! Did anyone else's pants get tighter or just me? Jokes aside it'd be nice to get some new buggy bits, even better with a little game involved. I'm guessing, box game set then individual buggies released separately after a few months or so. Could be a good get. Boyz!.....Start, your ENGINES!!!!!!!!!!!!!!!! (Wheres that blasted horsepower emoji?!!) I'm likin' dis, and deyz red too! P.S. You made my day Lexington! P.P.S. "Fink I's gonna be 'avin some more SunBurnz soon " You can never have too many red wunz Badfang! Hmmm, I approve of the box art but I worry about the Chinese only statement. Seriously, if GW made this an exclusive product to asia I think I'll just go nutz and leave 40k. Would be a massive insult to ork players. Right now I am keeping calm. I just knkw gw will screw this up in some way by making them none gw models or making them super limited for some stupid reason like they normally do. Just seen this come up on u-toob https://www.youtube....h?v=TrmUWYd0GTI - not a hell of a lot in it but interesting to note that he puts up a pic of the box sides with same artwork but all English writing on the sides. 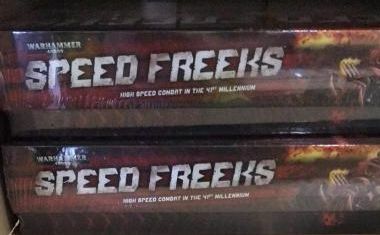 Plus if it's China only then why has it got SPEED FREEKS writ large on the top of the box? (well, EED FREEKS actually, suggesting that there's a bit of the front of the box that they ain't showing us ). EDIT - Don't GW normally put a pic of the box contents up the left side of their boxed games? 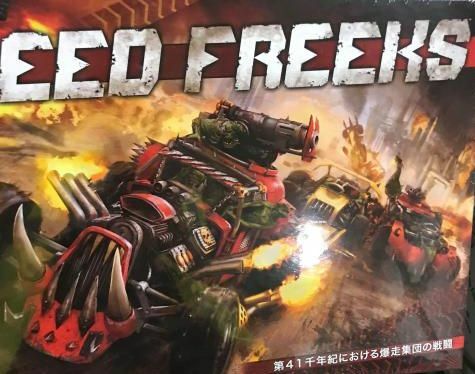 "In 41st millennium, the battle of the ork speed gang"
I live in vietnam so maybe i can grab this depending on when it comes out. Just 'High speed combat in the 41st millennium ' in English. 'In 41st millennium, buggies drive you ' in Russian?